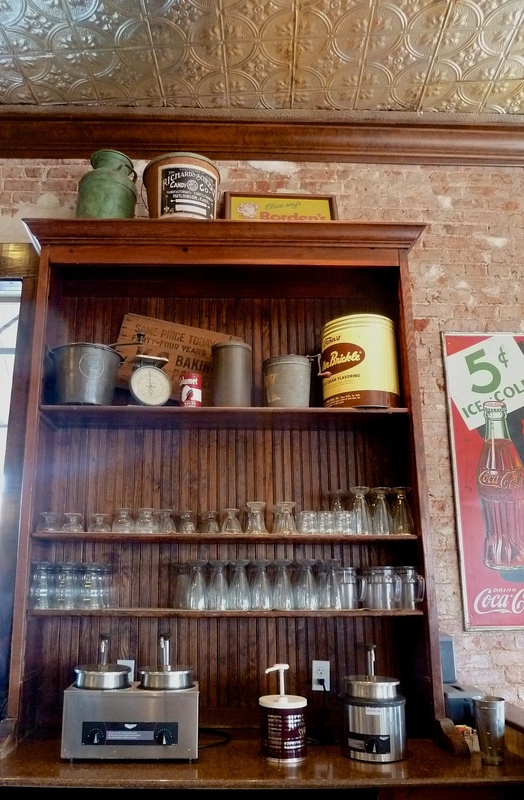 Old-fashioned soda fountains are truly hard to find. Another Time Soda Fountain and Cafe in Rosenberg, Texas was renewed and updated by Owner, Renee Butler, about 10 years ago. On this day of celebrating the life of Martin Luther King Jr., I'm happy to go back in time with Renee Butler, the owner who rebuilt this Rosenberg, Texas, institution. She explains how an African-American man found healing in this historical site...In his words...he came in the 60's and was told "we don't serve your kind"; and in his words, "I took the walk of shame out the door." Now he happily brings his grandson and they share a love for the history and food finds restored by Renee, the owner. He bears no anger or hatred of the past but instead treasures what she pours into the soda fountain and it's patrons, the food, ice cream and Coca-Cola with a giant scoop of LOVE! I asked. What are the favorite items you sell? How do the choices differ depending on their ages? "If you were here in the 50's your favorite dish is an Ice Cream Soda; there are patrons who drive from Houston just to experience it." An 81 year old patron who pops in every week with her son, actually orders half a sandwich, but then she decides to take the sandwich home for dinner and order a whole banana split...she eats the whole thing! If you order a Coca-Cola, it will be made the same way it was in the 50's; not the carbonated, syrupy combo version, so prevalent today. If you're 10 years old your favorite will probably be the banana-split, made the simple but spectacular way Renee chooses to make them. If someone orders one, she immediately prepares for at least 5 more, because as it floats across the room, the orders come rolling in. On this particular day, my friend and I shared Chicken Tenders and a bowl of Chili. We were too full to down the strawberry shakes, but we'll be back. "What keeps me in business is? When a customer comes in and says...I remember...with my grandson...or with my daughter...with my Mother, I did....One gentleman came in with his son and shared "I always bought a shake for my son and now he's treating me today." It's those moments that provide a purpose beyond the food and business. It's the multi-generational connections made over a banana-split that remind us to embrace the past and enjoy the present. So go back to Another Time Soda Fountain and Cafe in Rosenberg, Texas.